1 of 4 Cook rice per package directions. Cool 15 minutes in lidded pot. Fluff, then transfer to a rimmed baking sheet. Cool in refrigerator. 2 of 4 Meanwhile, bring a separate pot of water to a boil. Add lentils. Return to a boil; cook 6 minutes. Drain and rinse under cold water until cool. 3 of 4 In a large bowl, whisk together oil, pomegranate molasses and salt. Stir into cooled rice and lentils. 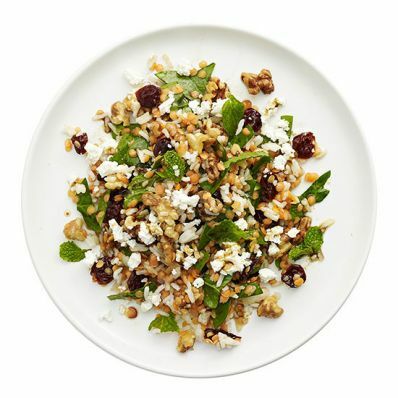 Gently fold in spinach, mint, cherries, walnuts and feta. Serve at room temperature or chilled. 4 of 4 NOTE: Can't find pomegranate molasses? Whisk together 1 tbsp honey with 2 tbsp pure pomegranate juice. Per Serving: 12 g pro., 489 mg sodium, 15 g Fat, total, 8 mg chol., 358 kcal cal., 8 g fiber, 3 g sat. fat, 44 g carb.